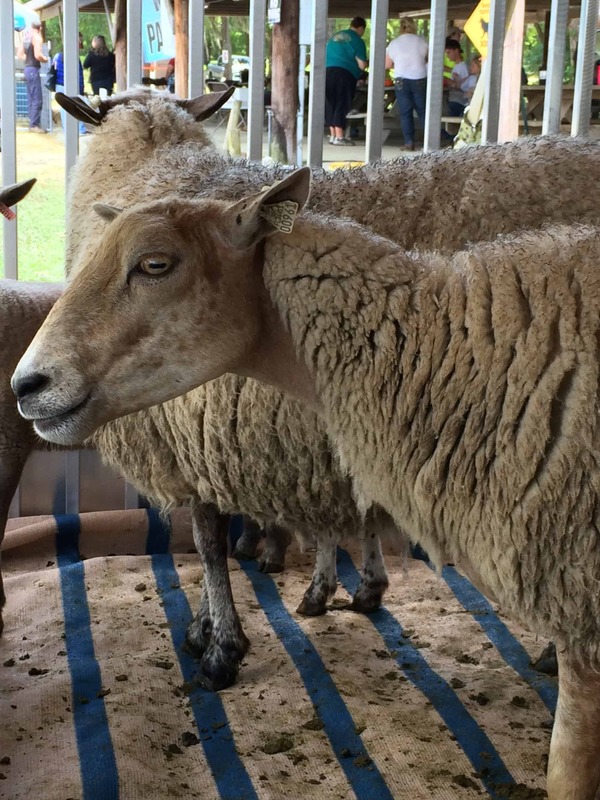 The Florida Sheep, Wool, and Herding Dog Festival is held at the Greater Ocala Dog Club Grounds in Ocala, Florida, which is about an hour and twenty minute drive from my house. I only attended the Festival on Friday because I did not want to be away from home three weekends in a row. My mother decided she wanted to come with me, check out the Festival a little bit, then drive another 45 minutes up to Gainesville to pick up copies of her newly-published book from the University Press of Florida. (The book is Fed Up: The High Costs of Cheap Food by Dale Finley Slongwhite. She’s been working on writing it for 4 years, and I have read many, many drafts along the way. It is so exciting to see it in print!) I would stay at the Festival for the scheduled spin-in and she would come back and pick me up after she got her books. We left my house around 10:00 am and headed to Ocala. We decided to eat lunch when we got off the exit in Ocala. I am vegetarian, so finding something to eat at a fair or festival is hit or miss. This was a fairly rural area, with few options off the exit, but we did find a Subway inside a gas station. Since we took the break to eat, we did not get to the Festival grounds until 12:15 or so. I admit that when we first got there, I was disappointed. Parking was on the grass, which was no big deal, but only a couple dozen cars were parked when we arrived. Everything appeared to be set up under tents or a large picnic pavilion, and the only bathrooms were port-a-potties. I was not disappointed in the end. It is definitely a small event (and Friday is the slowest day), but it is a very friendly one. It felt like going to summer camp, or maybe a really big family reunion. With the running around I’ve been doing recently, it was exactly what I needed. 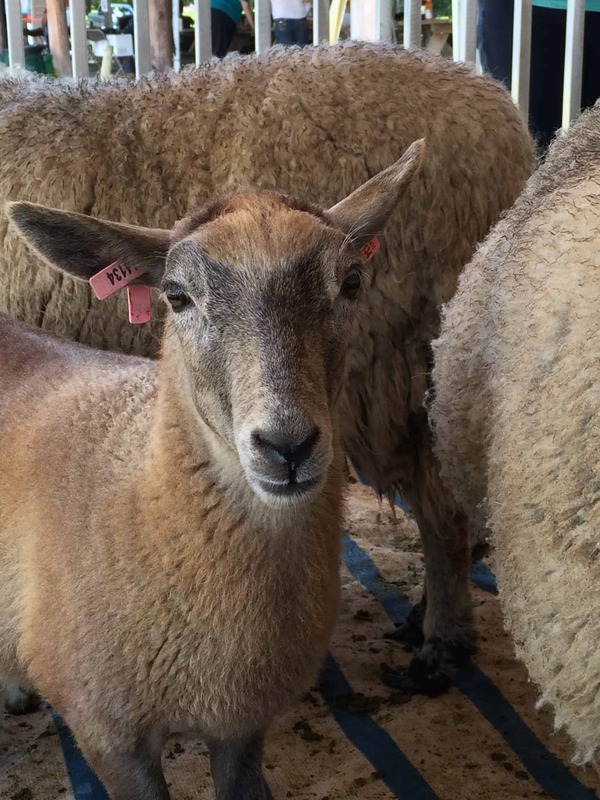 The first thing we did was stop in the sheep tent. Under the tent were 4 pens, each with a different kind of sheep. They were all interesting breeds that I had not seen before. 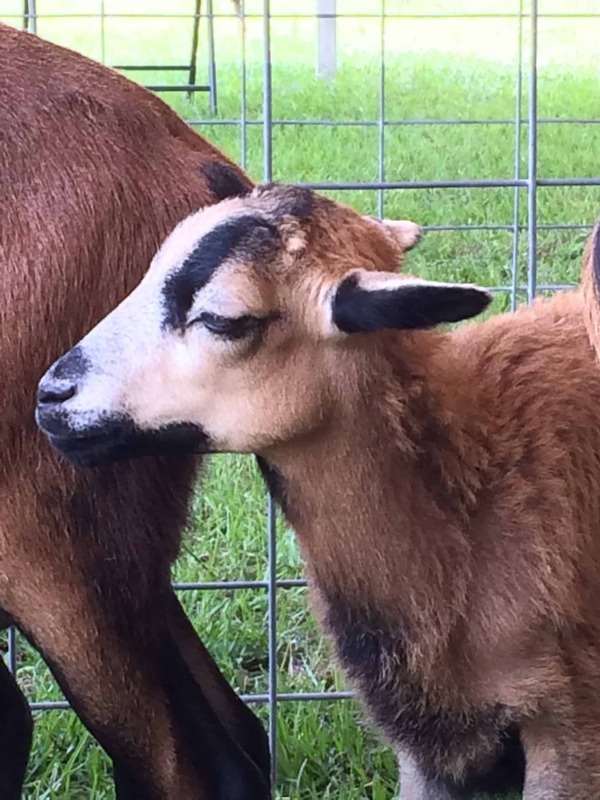 First up was the Florida Cracker Sheep. 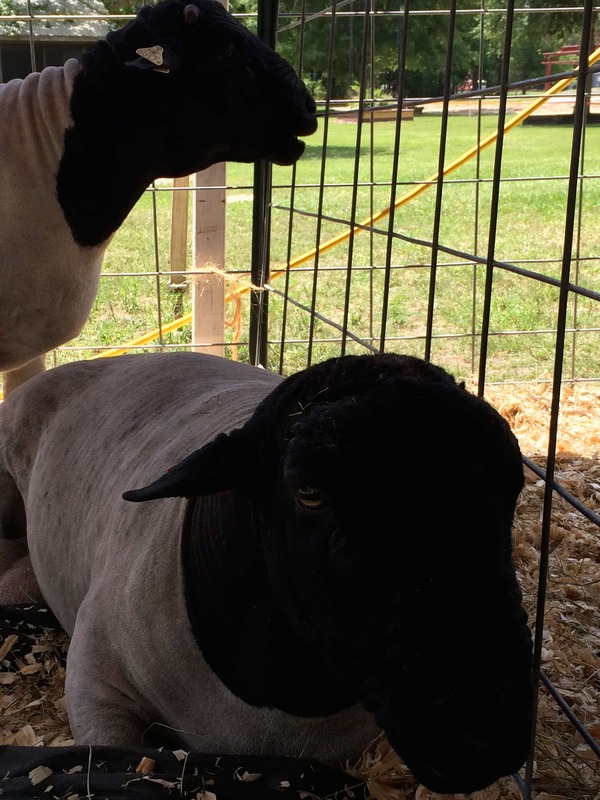 These sheep are descendants of the sheep originally brought to Florida by Ponce de Leon in 1521. I knew that the Spanish brought cattle to Florida around that time and that the cattle were allowed to free range through swamps and highlands at will, then rounded up and driven to various ports for shipping throughout the world. I did not know that the Spanish brought sheep with them, and that the sheep were handled in the same manner as the cattle. Ralph Wright, the Founder and President of the Florida Cracker Sheep Association, had a table next the the pen of Florida Cracker Sheep. He told me that Florida Cracker Sheep are the most pest-resistant sheep in the United States (he may have said the world, but I’m not positive about that). The next pen had Dorset Sheep. It was tricky to get a good picture of them, and this one does not do them justice. Their faces are all wrinkly, like a Shar Pei. They are adorable!!! Another pen held the prettiest sheep I have ever seen. These deer-like creatures are Barbados Black-bellied sheep. After the sheep pens, we headed under the picnic pavilion. At one table, a group was working on doing some needle-felting. I did not take any pictures of the finished projects displayed, but they were some of the largest and most beautiful felted projects I have ever seen. In the picture here, the participants are working on making a mat. The finished projects all used the mat as a base. Various colors of wool (both natural and dyed) were then felted onto the base to make pictures or patterns. They were stunningly beautiful. The man in the orange shirt is Doug Myers, the President of the Meat Sheep Alliance. He was very friendly, asking if we had been in the Fiber Arts tent yet, and declaring that once I went in there I wouldn’t want to leave (an accurate prediction). Later, when I was in the Fiber Arts tent spinning, his mother came in with one of Doug’s grandchildren and we chatted a while. She told me she taught Doug to knit and crochet when he was a boy. A spinning wheel sitting in one corner of the Fiber Arts tent was Doug’s also. Later still, when my mother and I were leaving, we happened to pass Doug. He greeted us again and asked if we had enjoyed ourselves. He also pointed me in the right direction to get some sheep-raising information for a friend. His friendliness was a part of the reason this event felt so much like a family reunion. By this time it was almost 1:00 pm, the time the spin-in was scheduled to start in the Fiber and Creative Arts Tent. I headed back to the car, got Essay, and headed into the tent. It turned out that there were fiber vendors in there! Only four of them, but you don’t necessarily need a lot. Several folding chairs were set up along one side of the tent. I sat there and spun for 2 or 3 hours. The tent did not have a floor; it was set up right on the grass, and I was worried that the ground would not be level enough for the wheel, but it was. Most of the time I was there, I was the only one sitting and spinning in that area. A couple women came with drop spindles and stayed for a half hour or so. Several people came into the tent and watched me spin, chatting for a bit and asking me questions about spinning. The children were the best. 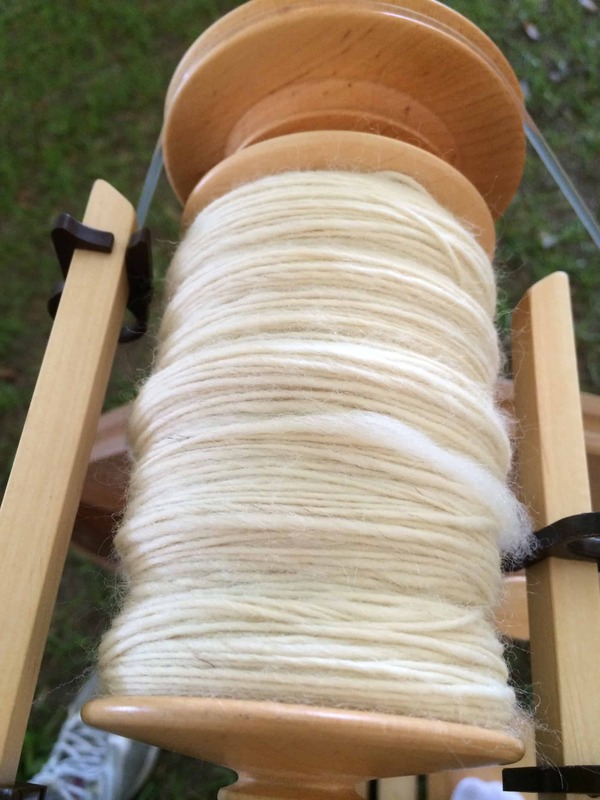 I let them touch the wool before it was spun and then the newly spun single, so they could feel the difference. It was an interesting experience. I’ve knit in public a lot, and rarely does anyone come up and ask questions. I’m not sure if it was because of the location or if it was because of the spinning, but almost everyone who walked into the tent stopped to watch and chat. I had only had the wheel for 4 days, so I felt unqualified to answer questions. I did the best I could! After spinning for a while, I checked out the fiber booths. I ended up buying a couple of things. 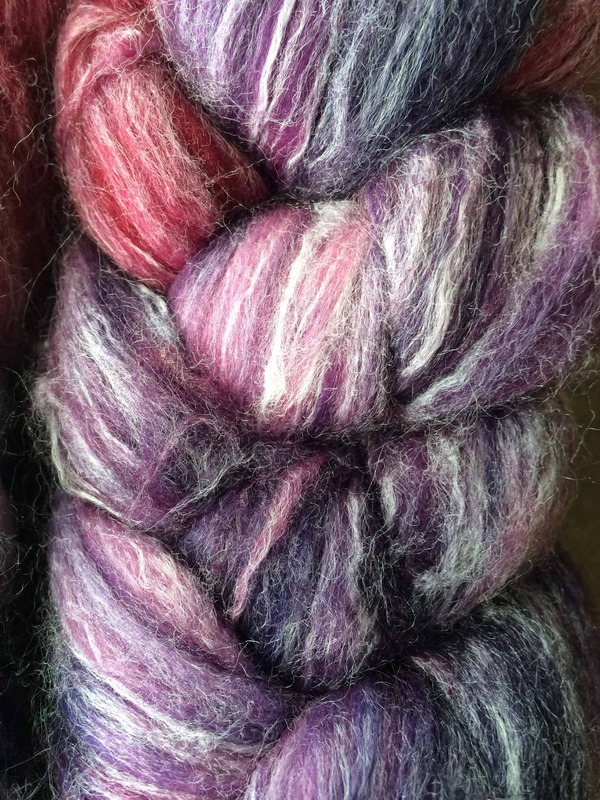 The braids are a superwash merino / nylon / bamboo blend, gradient-dyed by Ewephoric Fibers. 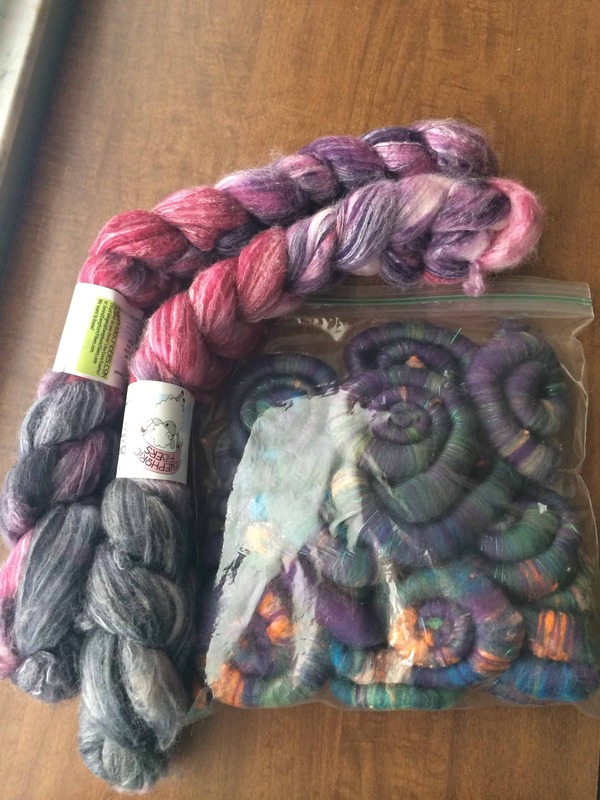 The Rolags are from Twin Mommy Creations. The white streaks in the braids are caused by the bamboo, which does not take up the acid dyes. This causes a pretty heathered look in the braids, and I can’t wait to see how it spins up. Here’s a close-up picture so you can see it better. Ann of Twin Mommy Creations (her twins are nearly 3 and she told us some hilarious stories about them!) was making rolags while sitting at her booth. 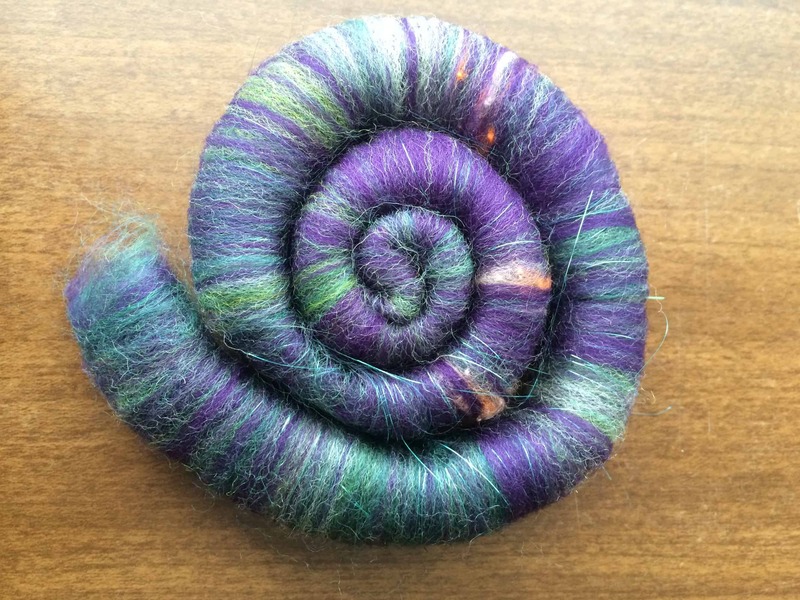 I just love the snail spiral appearance of the rolags. Ann gave me one to try spinning from and it was pretty easy, so I bought the bag of newly-made rolags. 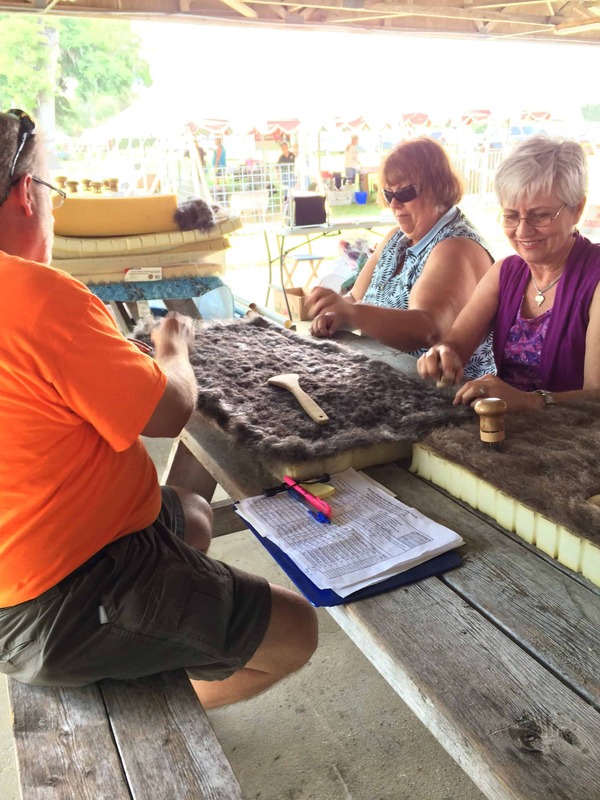 I really enjoyed my time at the Florida Sheep, Wool, and Herding Dog Festival. The laid back, relaxing afternoon was exactly what I needed. On her blog, Ann of Twin Mommy Creations wrote that 1700 people attended the Festival. The weekend must have been much busier than Friday! Next year, I plan to attend on the weekend, so I can meet more spinners and see some of the Herding Dog competition. But I will try to attend on Friday as well, because I need more of that chill, summer camp feel in my life. Great description of our adventure that day.